According to American Red Cross, one in four people will need a blood transfusion sometime in their lifetime. However, in Turkey, only less than 4% of the population donates blood annually, which is not even near covering the blood needs of the people. Therefore, in emergency situations, people desperately develop their own ways of searching blood donors and try to contact them using social media or websites, which are not efficient ways to reach them. Data of the patient who needs blood is automatically entered to the KANVER databases that had been established to the hospitals. 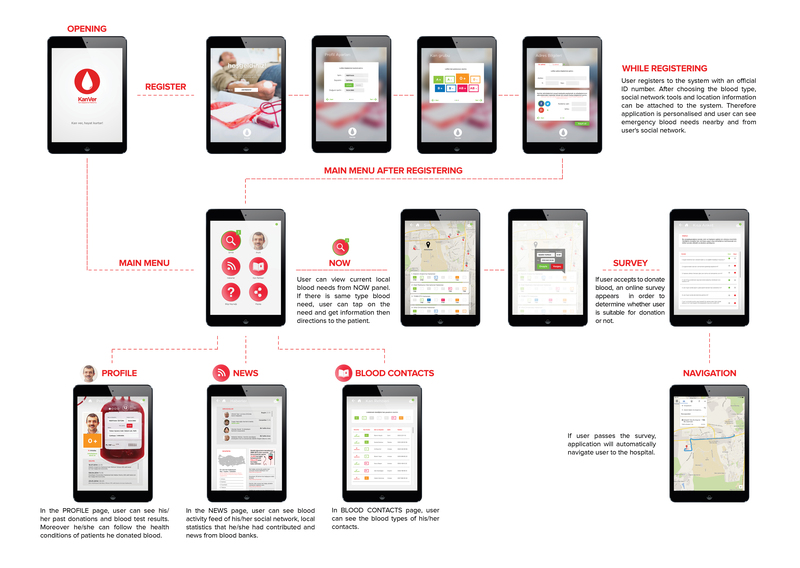 Potential blood donors are able to view these needs via their smart phones , tablets or personal computers. Thanks to this system, relatives of the patients, who are already facing a depressing and exhausting moment, does not need to worry about the blood searching problem. KanVer received 1st prize in the Social Entrepreneurship category of Entrepreneurship and Innovation awards by Turkish Scientific and Technological Research Council.